The jet maker delivered 61 of the single-aisle 737s in September, up from 29 in July and 48 in August. Boeing finally began to reduce its 737 delivery backlog in Renton last month, shown by figures in third-quarter jet delivery data released Tuesday by the manufacturer. As Boeing continues to roll 52 planes off assembly lines each month, that means the backlog of unfinished and undelivered planes was cut last month by nine aircraft, the first reduction since the buildup began in the year’s second quarter. “Our team remains focused on executing the plan and meeting our customer commitments,” he added. The logjam of planes, parked in all available spaces around the Renton assembly plant and the adjacent airfield, peaked at around 53 aircraft at the beginning of September. Boeing attributed the delays in finishing planes to a lagging supply of LEAP engines for the new 737 MAX model from CFM International, as well as late deliveries of fuselages from Spirit AeroSystems in Wichita, Kan. The late arrival of these parts caused a cascade of unfinished jobs to travel down the assembly lines. Managers added some 600 workers in Renton to help clear the backlog, but getting them up to speed proved difficult. Brought in either as new hires or transferred from other jet programs, many had no experience on the specific 737 work. 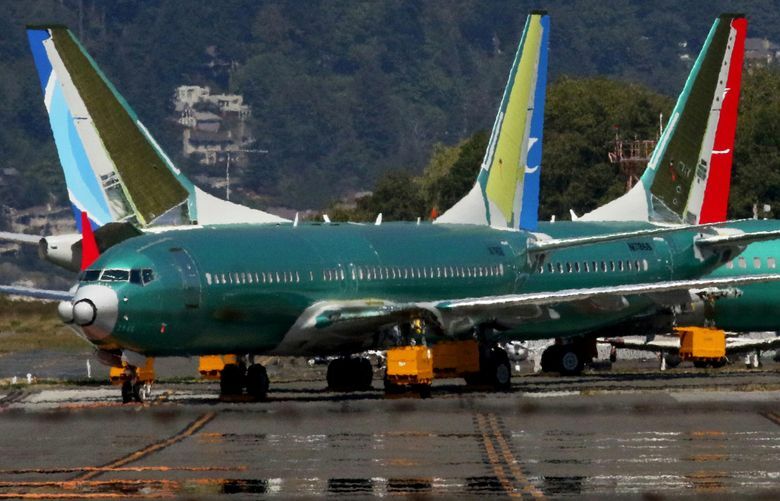 Boeing has been so focused on getting the situation under control that in early August it suspended flight tests of the new MAX 7 variant of the 737 so that the flight-test team could help with the 737 recovery efforts. Bergman said the two MAX 7 test planes will resume certification test flights “in the coming weeks” and that Boeing still expects to certify and deliver the first MAX 7 next year. With three months left in the year, Boeing’s commercial jet delivery total so far in 2018 stands at 568 aircraft. Throughout the delivery slowdown, management has stuck to its forecast that it will deliver at least 810 airplanes this year. If Boeing can keep up the September pace on 737 deliveries and work through the Thanksgiving and Christmas breaks, it should just reach that target. Meanwhile, Boeing continues to outpace European rival Airbus, which faces its own production issues. So far in 2018, Airbus has delivered 508 aircraft, 60 fewer than Boeing. Airbus trails Boeing even more on sales for the year. Through the end of September, Airbus had booked 256 net firm orders compared with 631 for Boeing.